This past weekend, Forest Hills water polo was on the road to Grand Haven for a two-day tournament where they went 2-2. Forest Hills won against both Jenison and Grand Haven but sadly fell to Grandville and East Kentwood. Sophomore Sarah Schenk led the team in goals with a total of ten by the end of the tournament. In game one against Jenison, Forest Hills won 4-2 in a good battle. 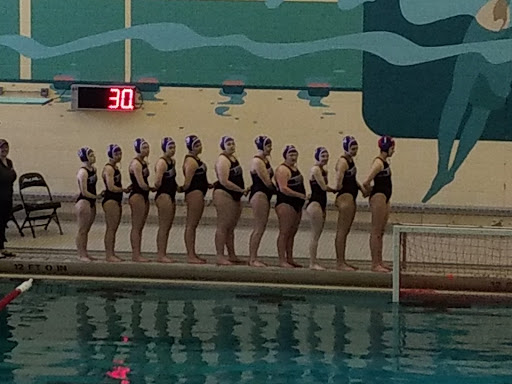 The FH water polo team took 28 shots on goal, only getting four of them in, but that was enough to earn them the victory. They had an abundance of steals that also attributed to the victory, which totaled up to 13 among the team. This was Forest Hills’ second time playing Jenison this season and winning against them. The second game was played against East Kentwood. FH water polo was tied with the Falcons at a score of 5-5. They went into overtime and lost when East Kentwood scored one more goal, making the final score 6-5. Sophomore Sarah Schenk led in goals, steals, and shots on goal during this game. The sophomore class has been showing up ready to play and dominating in the games. During the third game, FH came out hard and attacked Grand Haven right from the start. They went strong and ended up winning the game 7-3. FHC sophomores Sarah Schenk, Maggie Zorn, and Olivia Luplow all scored to help secure the win for Forest Hills. This helped add to their 2-2 record of the tournament. The fourth and final game was against Grandville. FH set up a plan to tie the game by having their goalie shoot from the half line within the last five seconds of the game. Sadly, the ball was blocked by an opposing team member and Forest Hills ended up losing the game to the Bulldogs with a final score of 6-5. Overall, the team had an average yet successful tournament this past weekend. They look ahead to continue their road to states and have an unforgettable season.